Prints of David's paintings, available from this web site, are fine art giclée archival quality, produced by professional printing labs on high quality papers. They can be purchased in various sizes via secure online transactions using PayPal. See Info for further details about ordering giclée Prints. David's work reflects his enthusiasm for searching out special places. His subjects range from views of Sussex and the South Downs Way to exotic world locations and dramatic coastal landscapes. Some of David's latest work has been inspired by recent trips to St Ives. 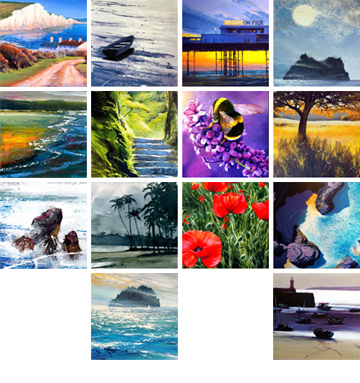 David is a member of Fiveways Artists Group who exhibit in the Brighton May Festival of Artists Open Houses. See David's Open House photos. Original acrylic and watercolour paintings and packaged greetings cards are also for sale. Contact the artist for more information. Click to view full catalogue of prints and view images and prices. New works are added every month.